Het Beloofde Landt Canaan door wandelt van onsen Salichmaecker Iesu Christo nessens syne Apostelen. 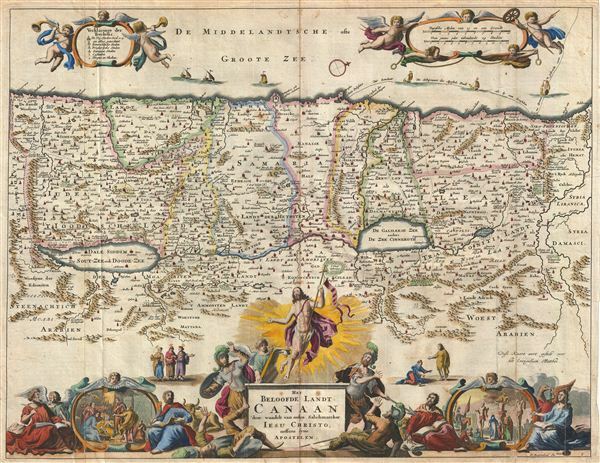 This is a splendid early example of Bastiaan Stoopendaal and Jacob Keur's c. 1702 map of Canaan (Israel or Palestine). Oriented to the west, this map covers the Holy Land from the Mediteranean to just beyond the Jordan River. This map purports to illustrate the Holy Land as it appeared at the time of Jesus Christ; however, numerous elements from earlier periods have been inherited from Stoopendaal's various source maps. These include a fleet of ships in the Mediterranean transporting cedar from Sidon to Jaffa for the construction of Solomon's Temple and, in ruin at the bottom of the Dead Sea, the corrupt cities of Sodom, Gammora, Seboim and Adama. This map is derived from Nicholas Visscher's 1660 map of the same name, and though cartographically nearly identical, features updated decorative elements. These include scenes from the life and travels of Jesus along the bottom of the map. This map was published by the Keur family in their popular Keur Bible. As one of the Dutch 'Staten' bibles published between 1637 and 1760, the Keur Bible contained five or six maps: Werlt Karte, Paradys, Perigrinations, Canaan, Ierusalem, Reysen Pauli, and sometimes Reyse der Kinderen Israels. This specific map was issued in the1702 edition of the Keur Bible. Daniel Stoopendaal (1672-1726) was a Dutch engraver and mapmaker active in Amsterdam during the early part of the17th century. Stoopendaal is best known for his garden and landscape prints. Cartographically D. Stoopendaal's most notable work is his re-engravings of Visscher maps of the Holy Land for inclusion in the Keur Bible. Daniel Stoopendaal is often confused with Bastiaan Stoopendaal, an engraver associated the Visscher firm, with whom he frequently work but was most likely not related. Claes Jansz Visscher (1587 - 1652) established the Visscher family publishing firm, which were prominent Dutch map publishers for nearly a century. The Visscher cartographic story beings with Claes Jansz Visscher who established the firm in Amsterdam near the offices of Pieter van den Keer and Jadocus Hondius. Many hypothesize that Visscher may have been one of Hondius's pupils and, under examination, this seems logical. The first Visscher maps appear around 1620 and include numerous individual maps as well as an atlas compiled of maps by various cartographers including Visscher himself. Upon the death of Claes, the firm fell into the hands of his son Nicholas Visscher I, and would, in turn, eventually be passed on to his son, Nicholas Visscher II. Most of the maps bearing the Visscher imprint were produced by these two men. Many Visscher maps also bear the imprint Piscator (a Latinized version of Visscher) and often feature the image of an elderly fisherman. Upon the death of Nicholas Visscher II, the business was carried on by the widowed Elizabeth Visscher until it was eventually sold to Peter Schenk. Biblia, dat is De gantsche H. Schrufture, Pieter and Jacob Keur, 1730. Very good condition. Original centerfold. Platemark visible. Text on verso. Poortman, Wilco C., Kaarten in Bijbels, p. 197. Laor, E., Maps of the Holy Land: Cartobibliography of Printed Maps, 1475 - 1900, #810.